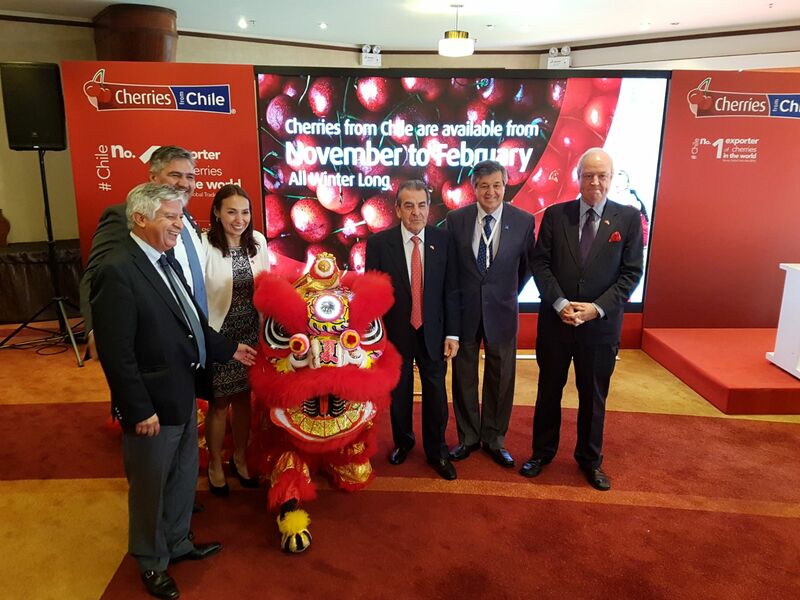 Chilean cherry exporters, who form part of ASOEX’s Chilean Cherry Committee, are launching an ambitious, consumer-focused promotional campaign in China, which will emphasize opportunities to share Chilean cherries with family and friends. Under the slogan, ‘Enjoy your red moment,’ the 2018- 19 campaign is aiming to build on the success of last year’s Chilean cherry promotional drive in China by taking in a wider range of cities, wholesale markets and retail outlets across the country. An industry-wide effort bringing together Chilean growers, exporters and the Chilean government, together with Chinese produce importers, distributors and retailers, the 360º campaign will feature outdoor media advertising and point-of-sale promotions across 65 cities over 39 days. In the run-up to Chinese New Year on February 5, 2019, the campaign will focus on social media actions, promotional work on China’s most important e-commerce platform, trade media advertising, PR events, and merchandising, as well as advertising on outdoor media. The reach of the campaign will be nationwide across China, with a greater emphasis on regional cities. Charif Christian Carvajal, Marketing Director of the Chilean Fresh Fruit Exporters Association (ASOEX) for Asia and Europe, said the focus of the ‘Enjoy your red moment’ campaign would be on occasions and moments when Chinese consumers can eat, share and enjoy Chilean cherries. “We want Chinese consumers to enjoy a ‘red moment’ with healthy, delicious Chilean cherries; a moment of sharing with family because Chinese people love sharing food around a table with friends and family,” he said. With the objective of strengthening the promotional presence of Chile’s cherry sector in China, the Committee alongside the association have this season opened its first China office, based in Shanghai. Ronald Bown, Chairman of the Board of the Chilean Fruit Exporters Association, said: “Last year’s cherry promotional campaign was very successful. In fact, it was recognized as the marketing campaign of the year in the Asia Fruit Awards event celebrated in Hong Kong earlier this year. In this context, we believed it was time to establish a China-based office with the objective of facilitating the implementation of the campaign and strengthening the ties with our key stakeholders in the market, thus leading to an even more effective campaign.” Estimates by the Chilean Cherry Committee, as of October 15, 2018, have exports of cherries from Chile worldwide reaching 180,000 tonnes. However, it should be noted that this may be adjusted in mid-November, given the recent adverse climatic conditions experienced in Chile.